1. The scalable practice of mitigating business risk by gathering multiple forms of intelligence, both internal and external to a company. 2. The strategic, competitive, environmental and financial analysis of this information. 3. The continual application of this analysed information into strategic decision making process. 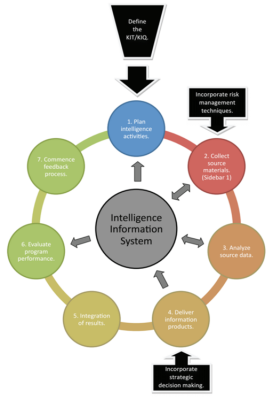 This practice is embedded in the Competitive Intelligence cycle which helps to close the loop on actionable insights.